The city of Seaside, California is home to the only known nesting colony of Heermann’s Gulls in the United States. The gulls have nested in Seaside since at least 1999, but over the years they have lost many nesting sites due to several unfortunate events. 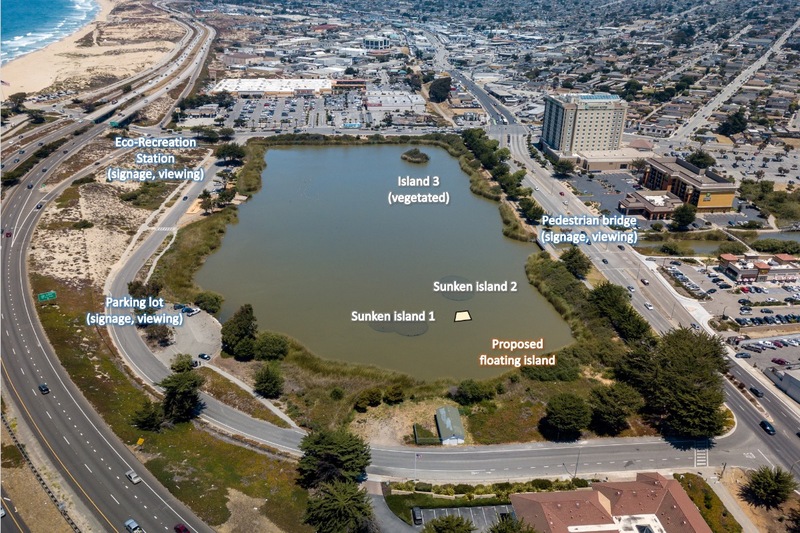 Please help Monterey Audubon build a floating nesting island in Roberts Lake in Seaside to give these birds a permanent home. Monterey Audubon has generously offered to match donations up to $25,000, so we need your help to make this project a success! The Heermann’s Gull is a beautiful migratory species. They are are long-lived, intelligent, and highly social seabirds who form lifelong pair bonds and cooperatively raise their chicks. The entire world population of Heermann’s Gulls was once thought to breed on just a few islands in the Gulf of California - 95% nest on a tiny island called Isla Rasa. Because nearly all Heermann's Gulls nest in a single location, they are uniquely vulnerable to human interference. In recent years, overfishing, introduced predators, soaring ocean surface temperatures, and rising sea levels have combined to pose a threat to the very survival of the species. Due to these factors, Heermann’s Gulls experienced total nesting failure on Isla Rasa 4 of the last 6 years. 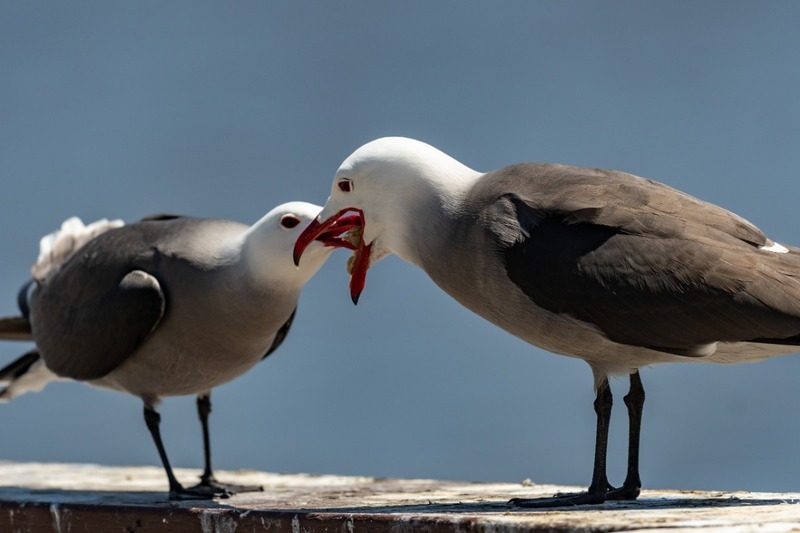 For the past 20 years, the city of Seaside has been home to a little-known secret: the first and only breeding colony of Heermann’s Gulls outside of the Gulf of California. In 1999, three pairs of Heermann’s Gulls nested on an artificial island in Roberts Lake, and fledged eight chicks! This was the first known successful nesting attempt outside the Gulf of California. Since then, the colony has struggled to survive through many setbacks. Their artificial island, which was made of fill, eroded and sank completely in 2007. From 2013 to 2016, they nested atop the roof of a warehouse near Roberts Lake, but in 2017, the building owner illegally erected netting over the gulls’ nests, causing their nests to fail. In 2018, several birds nested on the roof of the Seaside McDonald’s, but just as the chicks were hatching, a car slammed into the restaurant and it burned to the ground. Another group nested on a nearby low-slung rooftop, but a predator killed all their chicks. Finally, two pairs nested on the roof of the Holiday Inn Express, where they raised six healthy chicks. However, Heermann’s Gulls are not cliff nesters, and don’t know how to fledge from heights safely. Two of them glided off the roof into the parking lot before they could take off again, where they were vulnerable to predators and cars. 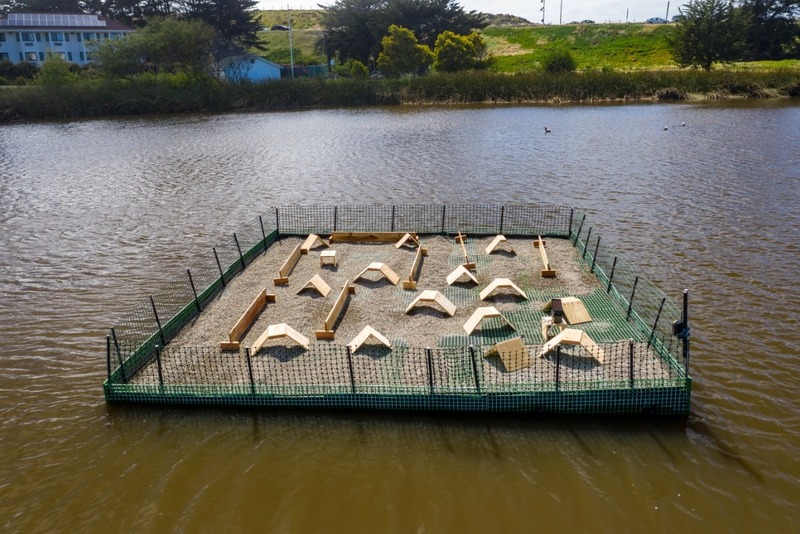 Monterey Audubon has launched an ambitious project to restore a nesting place for the Heermann’s Gulls in Roberts Lake, one that will last for decades and provide them a safe place to nest, free from human disturbance and terrestrial predators. 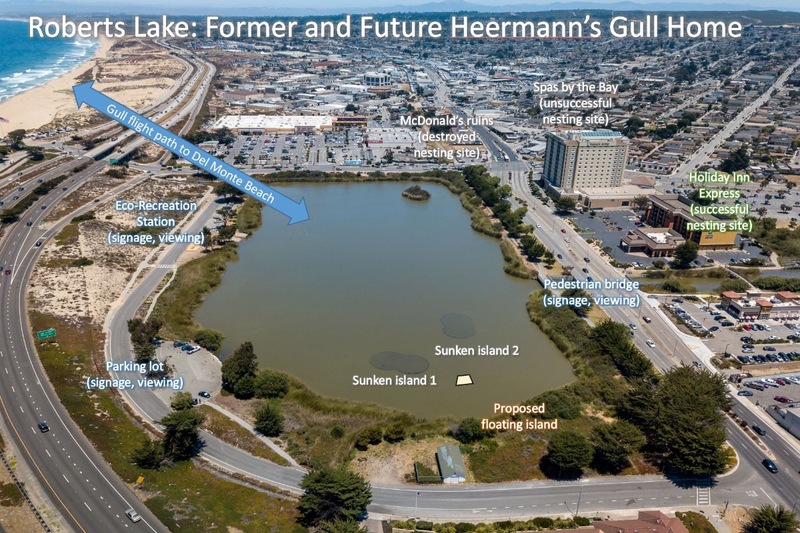 The Seaside City Council voted unanimously to grant us a Coastal Administrative Permit which will allow us to construct, install, and maintain an 18 x 20-foot floating nesting platform for the Heermann’s Gulls in the same lake their pioneering ancestors first chose. We also have a positive relationship and agreement with the model boat club that also uses Roberts Lake to ensure that both the boaters and the gulls may enjoy the lake. Our floating island will be custom-made by Floating Islands West LLC, which has substantial experience creating floating seabird nesting habitats, including a very large artificial Caspian Tern nesting island on Dutchy Lake in Oregon. The island will be a modular design made from recycled plastics that is inherently buoyant, extremely durable, and easy to deploy and maintain between nesting seasons. Fencing around the periphery will keep geese off and not-yet-flighted chicks on, and we will place chick hides on the surface such that chicks may seek refuge from aerial threats. The substrate will be bare and gravelly, per the gulls’ preference. 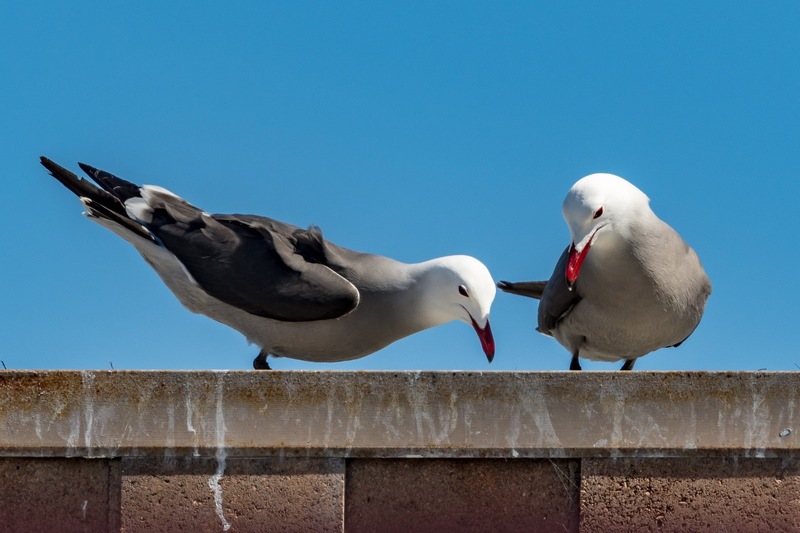 We will also use proven social attraction techniques to draw the gulls to the island, including Heermann’s Gull decoys and an audio playback system to broadcast Heermann’s Gull calls. The island will be firmly anchored in the lake, and monitoring of the birds will be done by cellular trail camera, from the shore of Roberts Lake, and via cautious drone surveillance. Please donate today to help us reach our target so we can deploy the floating island in time for the 2019 nesting season. Your donation will help fund the floating island, the social attraction equipment, and continuing maintenance of the island. Monterey Audubon is a 501(c)(3) nonprofit organization, so your donation is tax deductible. 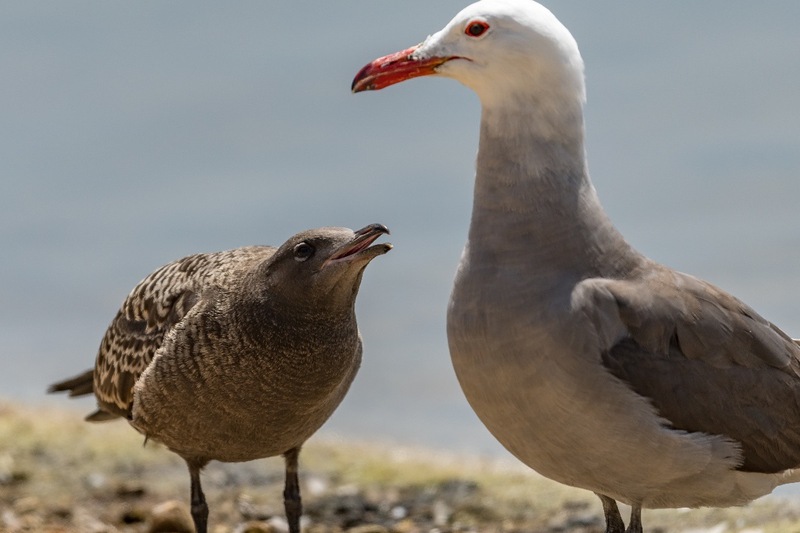 With the support of donors like you, we will ensure that regardless of what happens at Isla Rasa, the Heermann’s Gull will have a safe place to nest in Seaside. Fantastic news! We have officially deployed our Heermann’s gull nesting island in Roberts Lake as of April 13th, 2019! The assembly and deployment was an all-day affair; we are so grateful to all of our volunteers, particularly those from Sustainable Seaside, Monterey Audubon, and our supporters on social media. Laddie and his crew from Floating Islands West were fabulous as well in guiding us in doing something we’ve never done before. Many thanks to everyone for a job well done! The island isn’t quite ready for nesting yet; during deployment, it got a bit waterlogged and so is riding lower in the water than it ultimately will. This is normal, though the drying out has been slow on account of the cool, foggy weather we’ve been having in Seaside lately! We are giving it time to regain buoyancy before we finish applying gravel to the surface and properly place our chick hides and decoys. This is okay, as the Heermann’s gulls had already committed to nesting sites this season. We hope their rooftop sites won’t meet with catastrophe this year like they did last year. In the meantime, we’ve got plenty of time to perfect the floating island, and the gulls will have plenty of time to scope it out prior to next year’s nesting season! Even when everything is perfect next year, it may still take time for the gulls to decide to nest there. They are wild birds, after all, and have their own ideas of what they’re looking for! The important thing is that they will have a secure place to nest if they lose all their rooftop sites, since we know those cannot be guaranteed over the long term. We are so incredibly grateful to everyone who has donated and spread the word about our project. We are also grateful to the City of Seaside for their ongoing support. We are leaving this campaign active because we are not done yet – we will need funds for ongoing maintenance of the island. 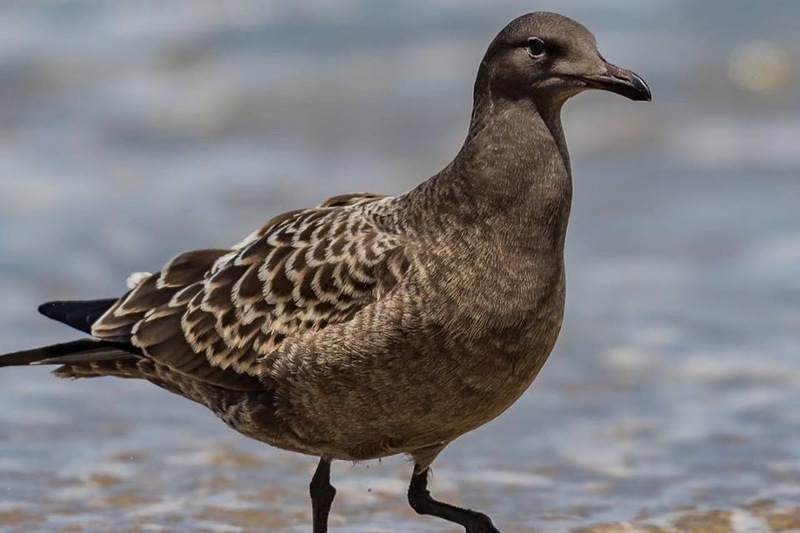 Additionally, we would love to raise money for interpretive signage around Roberts Lake to help educate the public about the Heermann’s gulls and why it’s so important to support them here in Seaside when their breeding grounds in the Gulf of California are being negatively impacted by climate change. Thank you everyone for helping the Seaside Heermann’s gulls! Stay tuned on our Facebook page and Instagram (both @SeasideHEEGs) for updates on this breeding season. 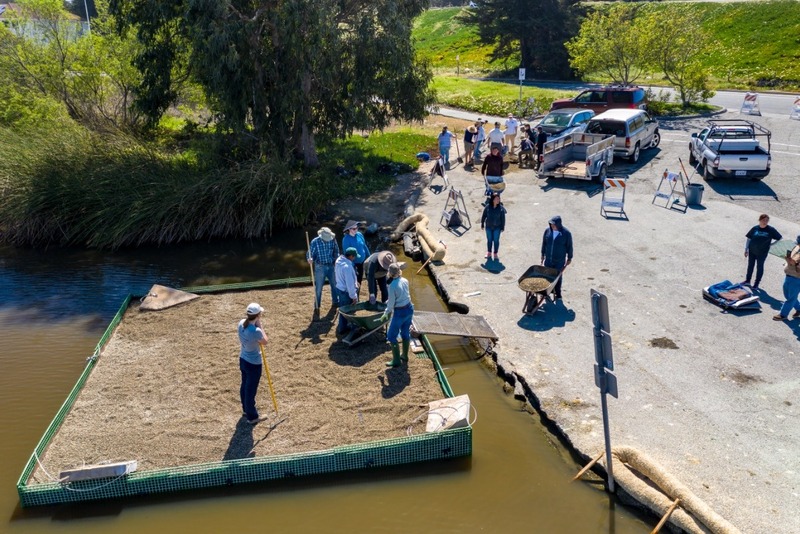 Great news on our floating island: thanks to all of your generous donations thus far, Monterey Audubon has been able to pay the deposit and place the order for the floating island with Floating Islands West! It will take about a month, give or take to manufacture the island, and then it will be ready to be delivered and deployed in Roberts Lake! Thank you so much to everyone who has supported us! We still need your help, as further donations will help fund the remainder of the cost of the island, the social attraction and monitoring equipment, and ongoing maintenance of the island. The Seaside Heermann’s Gulls, including this fresh fledgling, deserve a safe place to nest on their chosen home, Roberts Lake. Thank you SO MUCH to everyone who has donated thus far! I am so grateful for your support! I wanted to address a question we were asked, and that others who view our project may be thinking: why does a small floating island cost so much? Allow me to explain! Firstly, the money we are hoping to raise will cover not only the floating island and its anchoring system, but also equipment for social attraction, surveillance/education, and ongoing maintenance. The 18 by 20-foot floating island itself will account for the bulk of the cost. The sunken islands in Roberts Lake that the gulls used to nest on were made of fill. Unlike the remaining island, which is heavily vegetated, plants never took hold on these islands, and their barren surface made them appealing to the gulls. Their lack of vegetation, however, caused them to erode and sink below the surface by the early 2000s. Restoring these fill islands is not an option; without vegetation, you would have no island, but with vegetation, you would have an island unsuitable for the gulls. Instead, a floating island is the answer, and we have spent months examining all available options: wood frame, aluminum frame, prefab docking systems, and the Floating Island we ultimately decided on. The most significant deciding factor in our decision is the salinity of Roberts Lake. Roberts Lake was once a tidal estuary, before construction of Highway 1 cut it off from Monterey Bay. As such, it is quite brackish. Add to that the fact that the lake is surrounded by sand dunes and subject to coastal winds, and you’ve got a recipe for abrasion and corrosion. Aluminum frames are not suitable – they would corrode rapidly. A wood frame design would still require metal hardware, which would be difficult to inspect (as some of it would be under the gravel substrate), and would likely require replacement in 10-20 years due to abrasion from sand and subsequent corrosion. Replacement of the hardware would require towing the island to shore, removing the gravel substrate, and disassembling portions of the island, which would be far more difficult and expensive in the long run. Also an issue with wood-frame designs is the weight of the island itself. Heermann’s gulls require a gravelly substrate to nest on that is 1”-2” deep. Gravel weighs a LOT. Most prefab docking systems are not able to support the weight of the gravel, and wood-frame designs would require very large (and expensive) floats to do so. The edges of Roberts Lake are very shallow as well, which would make launching such a heavy island extremely difficult without the use of heavy equipment – again, another expense. The Floating Island design is made of modular units of lightweight recycled plastic that is UV shielded and will last indefinitely. This is a proven design that has been used to construct floating nesting islands, including a very large half-acre Caspian tern floating island on Dutchy Lake in Oregon (photos of it under construction here: https://flic.kr/p/7Jn2x1). The floating island will be extremely buoyant, and can hold a gravel surface without requiring additional floats. It is held together by cables that run through the island, below the substrate, so they can be replaced without towing the island to shore and without moving the gravel. Anchor cables can be replaced without pulling up the anchors. The island can be easily deployed in the shallow edges of the lake and towed to its final location; we have an electric dinghy ready for deployment and maintenance. Moreover, the submerged portion of the Floating Island supports a biofilm of beneficial bacteria that help soak up excess nitrogen, phosphorus, and other waste products produced by birds and fish. This can help reduce growth of algae and make for cleaner water in the lake. Maintenance will consist of biannual inspection – once in the winter before they begin nesting, once in the late summer once they are done. The gravel will be raked and the island cleaned up. The cables holding the island together and keeping it anchored will require replacement every so often, and the mesh fencing around the perimeter will also require upkeep, though the rest of the island should be pretty maintenance-free. Social attraction is the use of decoys and recorded calls to attract a species to a new breeding site. It has been successfully used for many, many seabird species: puffins, gannets, albatrosses, shearwaters, petrels, and yes, Heermann’s gulls! The reasoning is that many seabirds nest in dense colonies, so if you make a new nesting site look and sound like it’s already full of nesting birds, they are more likely to think it’s an awesome place to nest. 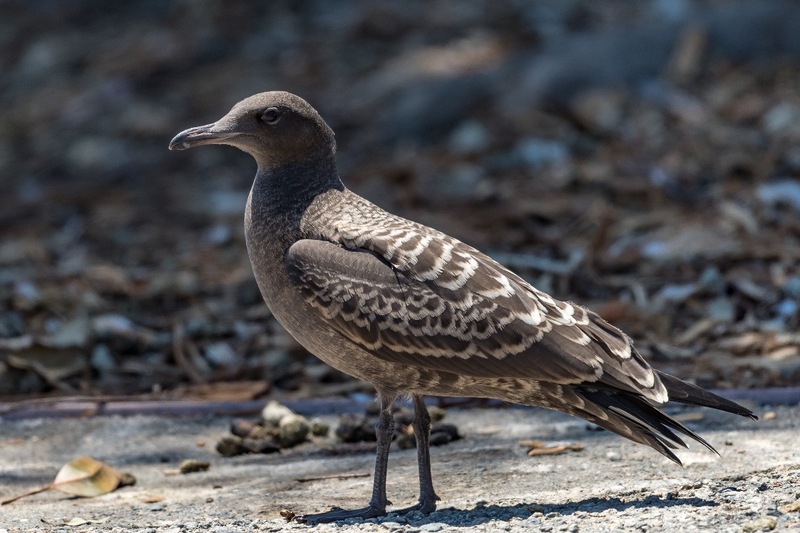 Social attraction has been successfully used to encourage Heermann’s gulls to nest on other small islands in the Gulf of California so that they are more spread out and thus less vulnerable than if their entire breeding population is on one small island. We think that it can work for our floating island, too. We plan to deploy several decoys and a sound system to encourage them to check out their new digs! Surveillance is key to any conservation project, and it is best to be able to keep an eye on things at all times. We will start with a cellular trail camera on the island so we know when gulls are visiting, how many are visiting, if they are engaging in courtship or nesting behaviors, and if there are any issues (predators stalking birds/nests/chicks, other birds trying to nest and/or drive out the gulls, trespassers, etc). We are supplementing this through careful aerial observation using a small drone with a zoom lens, flown at a safe altitude above the island; as this is our own drone, it is not part of the overall costs. We are also planning (at a slightly later date) to install signage at viewing points around Roberts Lake to help inform the public about the Heermann’s gull. “Seagulls” don’t always have the best reputation amongst humans, but we are hoping to change that through education! I hope this helps to answer your questions – if you have further questions, please ask! Thank you again for your support of our project! Great news! We have, at long last, received official approval for our Heermann's Gull nesting island project! We are launching our fundraiser today, 1/4/19, to help pay for construction of the floating island, social attraction equipment, surveillance, and maintenance of the island. Every donation is greatly appreciated, as is every share on social media! Thank you for your support!